The Doomsman opens in what seems to be the primitive past: A young man sits on the shore of a bay, dressed in a tunic. In the forest behind him are the heavy wooden walls of a stockade, a clue to the defensive nature of life in this sparsely inhabited country. But not everything fits. The young man is looking across the bay at a vague, dark outline of some tall structure, while in his hands he holds a book: A Child’s History of the United States. He is sitting on the shores of New York, looking out at what’s left of Manhattan. It would make a great opening shot for a movie — a YA post-apocalyptic movie. The Doomsman is, like After London, one of the earliest examples of the post-apocalyptic YA adventure. The plot follows the familiar pattern: A restless boy is trying to understand his society and discover how it fell from its seemingly more glorious and technologically marvelous past. Excitement, danger, and romance ensue; the boy proves his manhood, discovers the secrets of lost technologies, and seeks to win the girl. (The gender pattern here wouldn’t be swapped until decades later.) Much of what appeals to us in present-day YA blockbusters like the Hunger Games is here in Doomsman, in a form that only feels a little dated. The hero of the story is Constans, son of the ruler of a small walled settlement. America, and presumably the rest of the world, has been set back centuries by some poorly remembered catastrophe. It might have been plague — the specific cause isn’t described, only the ensuing panic. Whatever it was, the narrator tells us, once it got going, “the relapse into barbarism was swift.” Society is now divided into small fiefdoms, each one suspicious of the other. Trade, technological progress, and civilization are inhibited by the basic needs of survival — and especially defense. The small, fortified settlements of the countryside are threatened by a warlord clan called Doom, comprised of the descendants of criminals who inhabit the ruins of New York City. The Doomsmen make their living by raiding the surrounding inhabitants. Constans’ familiar little world is turned upside down when his father’s stockade is raided by a party of Doomsmen, led by one Quinton Edge. However, Edge isn’t there for plunder — he’s there to claim his secret lover, Constans’ sister Issa. Issa’s father isn’t about to let his daughter run off with some brigand. Words are exchanged and the bloodshed begins. Constans escapes in the chaos. The rest of the story is about how Constans infiltrates Doom society and how he rallies the rural communities to unite against the Doomsmen. He falls in love with a Doom girl, discovers the secrets of lost technology, and finally comes to understand why his sister took up with Quinton Edge. Like many later post-apocalyptic novels, the scraps of the last civilization’s technology have become an object for religious worship in the present one. In this case the technology is electricity, the secrets of which have been lost. The Doomsmen have a religion that is centered on worship of the “Shining One,” a giant face made of electrical lights and wires (and which bears an uncanny resemblance to the great face of the wizard of Oz). The caretaker of the Shining One is a priest named Prosper, who lives off the sacrifices of food brought by the worshippers. His primary priestly function is to maintain the dynamo that provide’s the Shining One’s power. Unlike the Wizard of Oz, Prosper doesn’t really understand the principles of electricity; all he knows are the rituals of maintenance that have been passed on by his predecessor. In every state-prison stood the “death-chair,” the visible embodiment of the moral force which the wrong-doer had defied, and which, in the ensuing struggle, had proved too strong for him. No wonder that it was both feared and hated by the citizens of the underworld of crime. Now that the social fabric lay in ruins, now that the very foundations of law and order had been razed, what could be more natural than the impulse to turn this instrument of legal punishment into one “of unlicensed vengeance? The recognition of those material agencies for the production of the apparition that had so terrified him gave Constans back his confidence; his books had not deceived him, and he was ready now for any fresh marvels that might be on the cards. The Doomsman owes much to the earlier After London, though it’s not a simple knock-off. Its themes are less well developed, but the plot is much better. Like so many YA novels of this genre, it takes a non-conformist stance towards society’s authorities. In The Hunger Games, that stance is against political authority. But another big target in this genre is authorities who promote fear of technology and work against a rational view of the world: Andre Norton’s Star Man’s Son, Poul Anderson’s Vault of the Ages, and Leigh Brackett’s great classic, The Long Tomorrow. All of these novels can trace their ancestry back to The Doomsman. 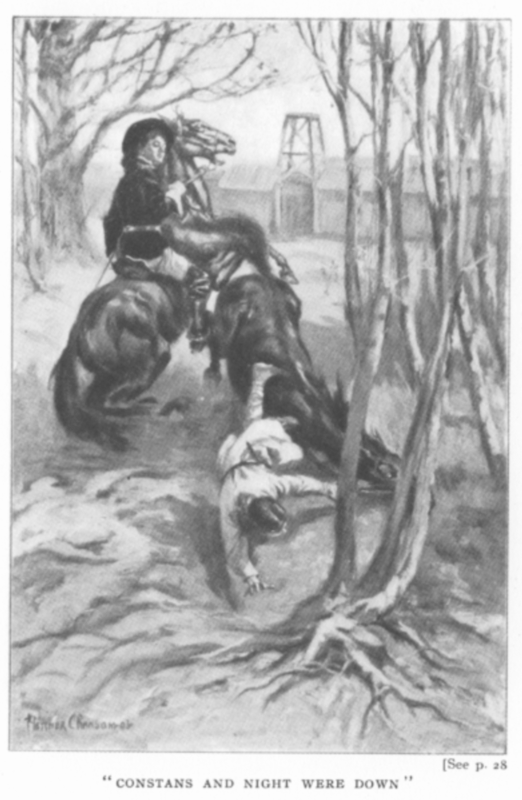 Image credits: Illustrations from The Doomsman, available from Project Gutenberg. Book cover via The Internet Speculative Fiction Database.